Chalk this one up to another of those “you should get this” records. I think I paid something like $4 for this, stupidly, I might add. The wife likes it, so that’s really all that matters. 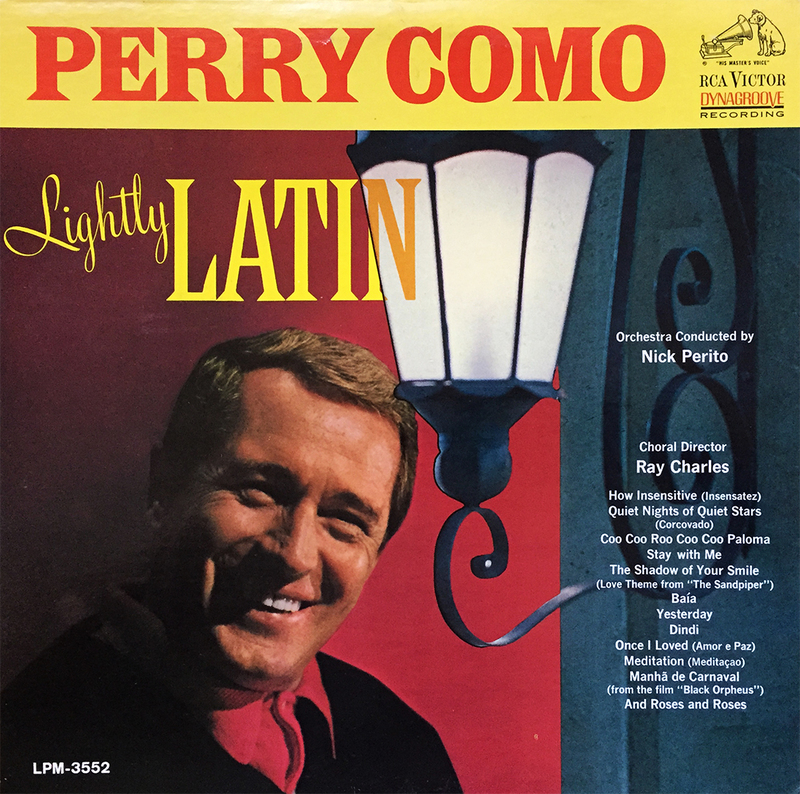 Actually, though there’s little-to-no Latin flair (ok, sure, the title is LIGHTLY Latin…), the Choral Director for this 1966 release was Ray Charles, and really, Perry Como didn’t put out a bad record, so in hindsight, the “you should get this” suggestion was a solid one (he said, reluctantly). What’s your dream soundtrack? Do you have a specific playlist for naps? Have you ever given it any thought? If you haven’t, by all means necessary, do not consider CBS Special Products’ 1966 sleeper, Music to Dream By. 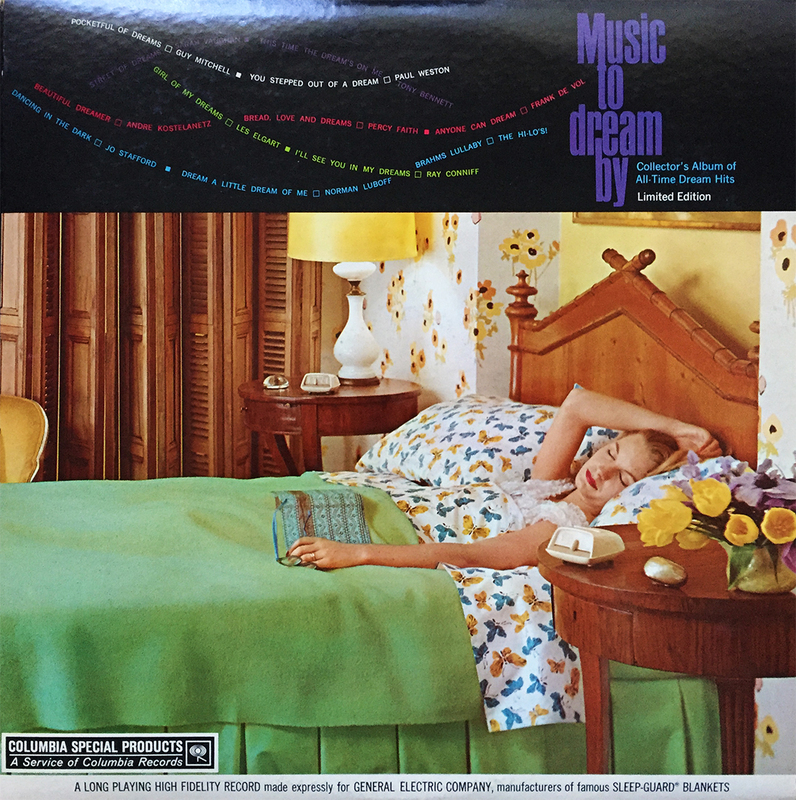 Filled with a slew of Percy Faith, Ray Conniff, and Guy Mitchell’s of the time, Music to Dream By was a “Collector’s Album of All-Time Dream Hits” compiled specifically for the GE company and their “famous” Sleep-Guard Blankets. Blankets… yup, you read that correctly. 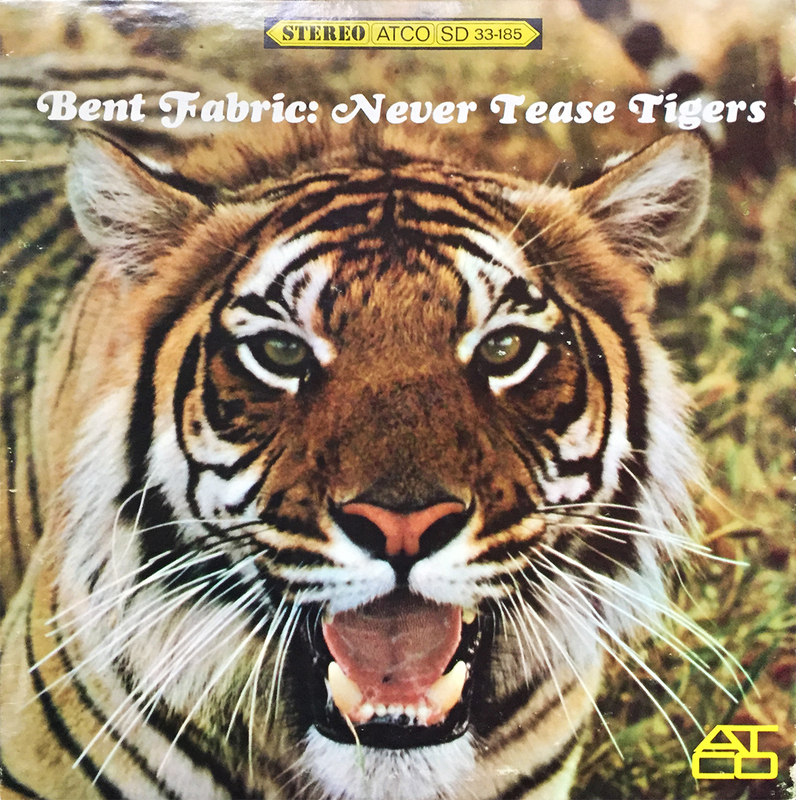 This here is a bona fide blanket record, and it will put you to sleep faster than a mashed potato sandwich. Proceed with extreme caution. It seems around the same time as my Creedence journey, or shortly there after (before? ), I stumbled across a record store closing its doors. 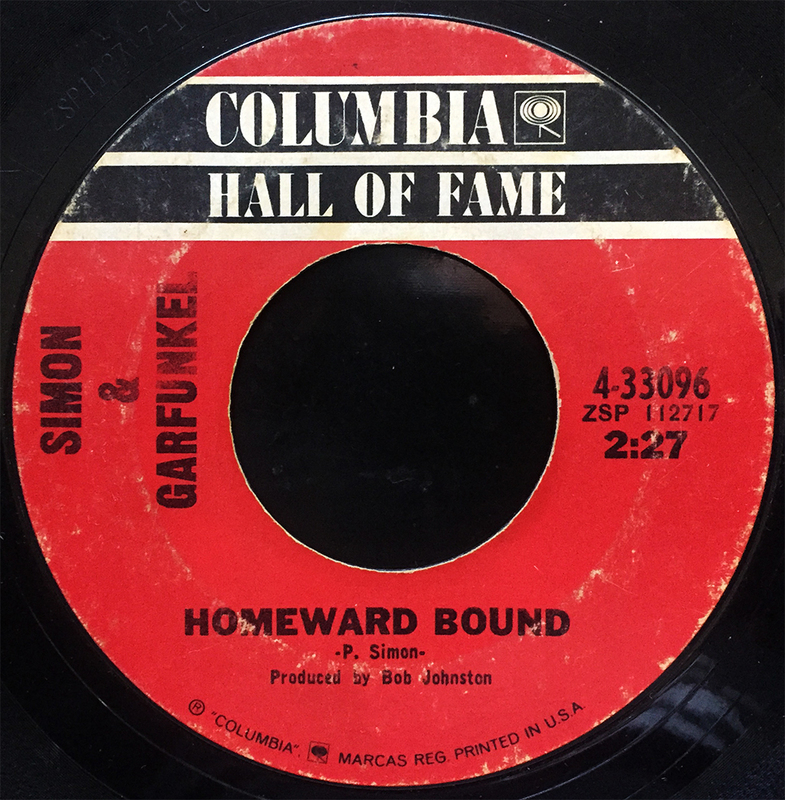 Everything in the store was half off, so after a solid hour (or four), I walked out with a treasure trove of goodies, including this Simon & Garfunkel 45, The Sounds of Silence b/w Homeward Bound. I remember ALMOST nabbing a Spinal Tap picture disc, that was proudly displayed on the wall (for another few weeks before the doors would be locked for good), but mostly, I remember being the only person in the store, rummaging through unexpected, and quite cheap (and potential) riches. I don’t recall the name of the store, but I’ll never forget the fate that timing allowed. I own a total of one Floyd Cramer record, and this is it. 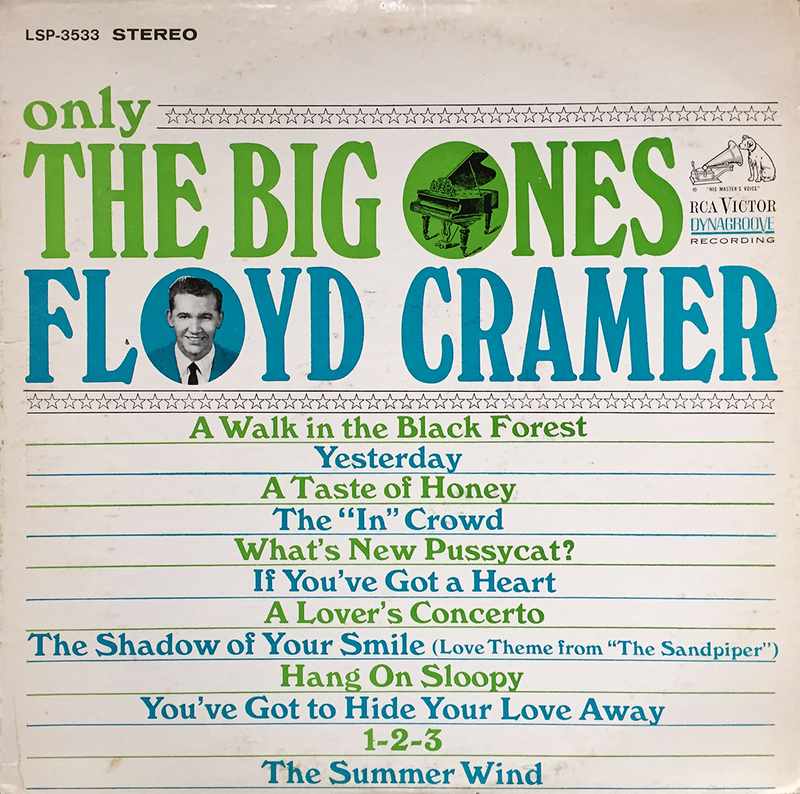 1966’s Only the Big Ones (RCA Victor), contains some pretty heavy-hitters: The Summer Wind, You’ve Got to Hide Your Love Away, Yesterday, What’s New Pussycat?, and a personal favorite, Hang on Sloopy. Only the Big Ones is a bit more groovy to be considered elevator music, but like “yesterday’s” addition, is a very good representation of uplifting, happy-time instrumental piano-jazz music. Nowhere among the sea of self-taughting verbiage is Enoch Light’s name found on this, seemingly LAST installment in the Persuasive Percussion series. 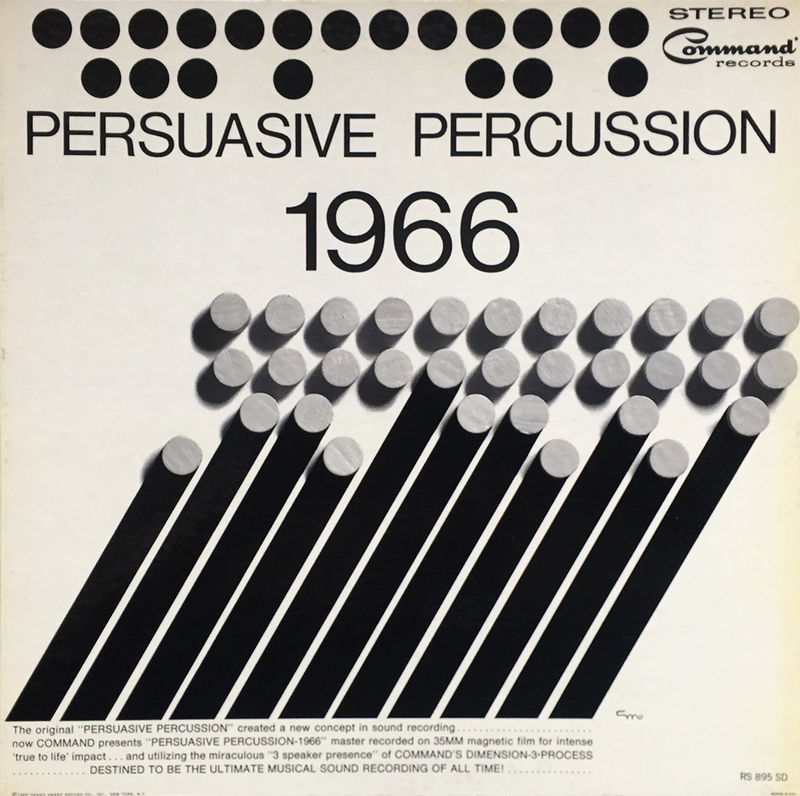 Complete with abstract minimalist cover, PP 1966 holds steady with the original four installments, but doesn’t offer very much other than, “more of the same.” That’s certainly not to say that Persuasive Percussion 1966 isn’t worth a spin, it just lacks a bit of that late 50’s flair found so prominently with the originals. The lack of Enoch Light may have something to do with that. 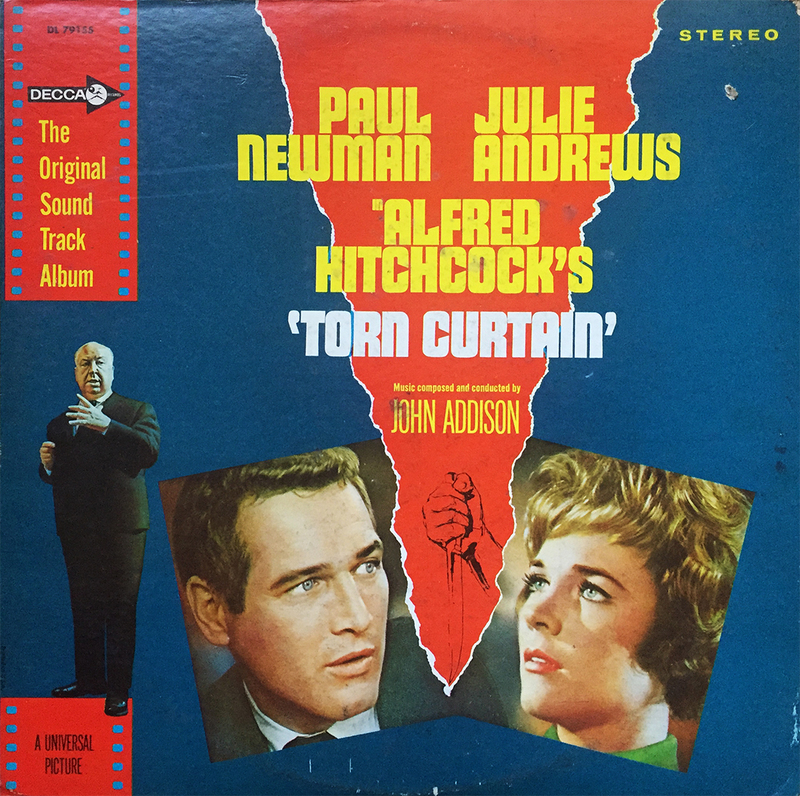 Torn Curtain, Hitchcock’s 1966 classic starring Paul Newman and Julie Andrews, has slowly become one of my favorite Hitchcock films, in no small part due to John Addison’s riveting soundtrack. Released by Decca the same year, this 12-track record clocks in at just under 30 mins, and serves as a perfect mini adventure for the ears as well as the imagination. If you haven’t watched it in while, I suggest taking some time during the holiday, and if you find a copy of the soundtrack on vinyl, I highly recommend picking it up. 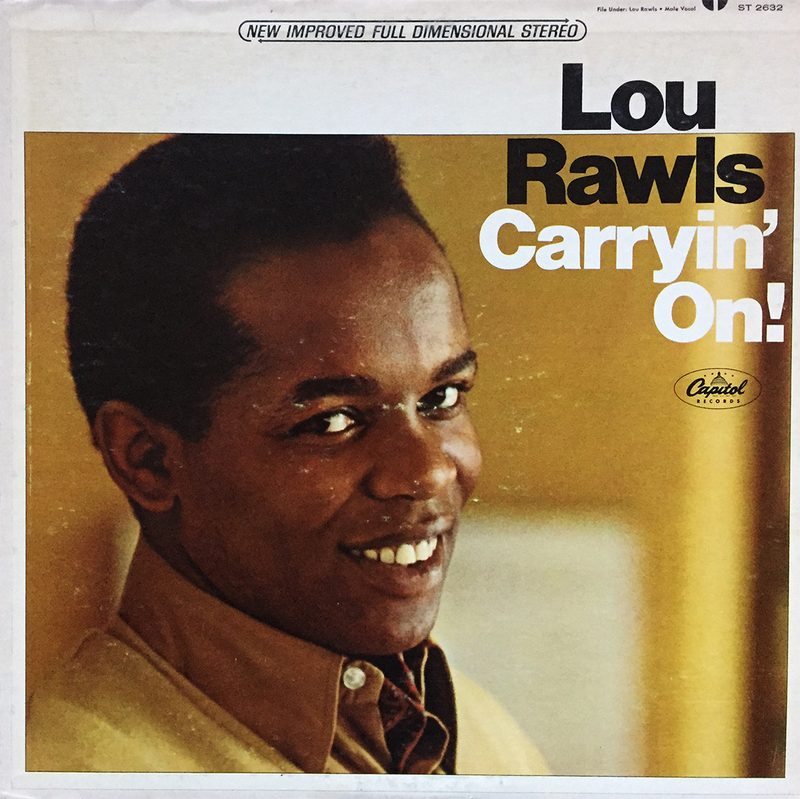 Back to the basics with Lou Rawls and his 1966 album, Carryin’ On! Mr. Rawls would release four albums in 1966; Soulin’, Live!, and a gospel album with The Pilgrim Travelers. This Chicago blues legend is perfect for any occasion, up to and including painting a door in between loads of laundry. 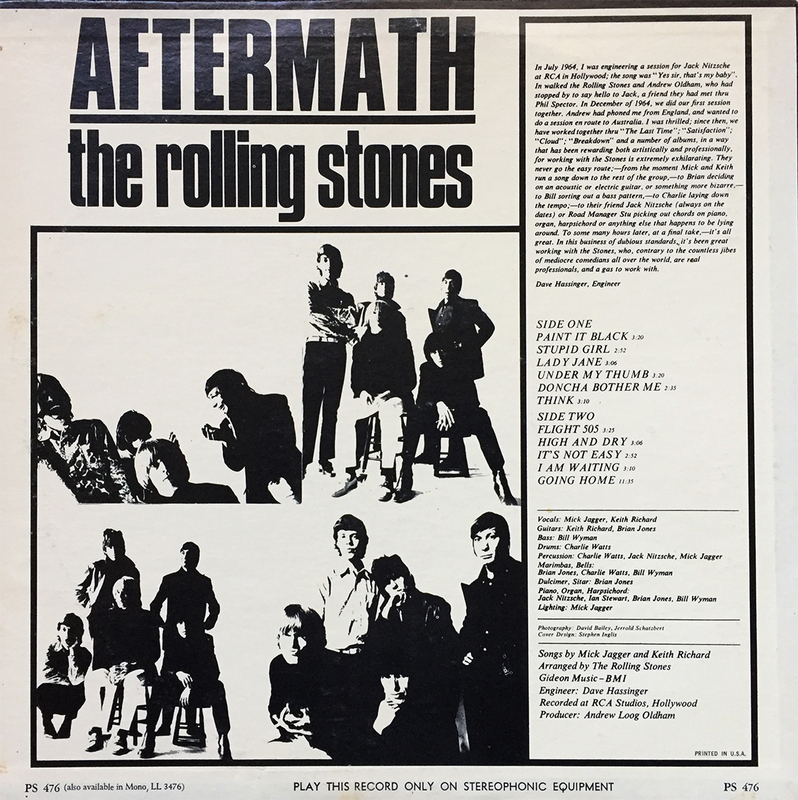 The Rolling Stones’ 1966 album, Aftermath (the band’s fourth studio effort in the UK, and their sixth in the US… figure that one out) is the first Stones album to 1) be recorded entirely in the United States, 2) consists of all Jagger-Richards compositions, and 3) was the band’s first “true stereo” release (thank you Wikipedia.org). Though the covers differ depending on your side of the pond, the flip side features (generally) the same layout. None of this matters, of course, because Aftermath features the following, early Stones classics: Under My Thumb, I am Waiting, Lady Jane, and a personal favorite, Paint it Black. 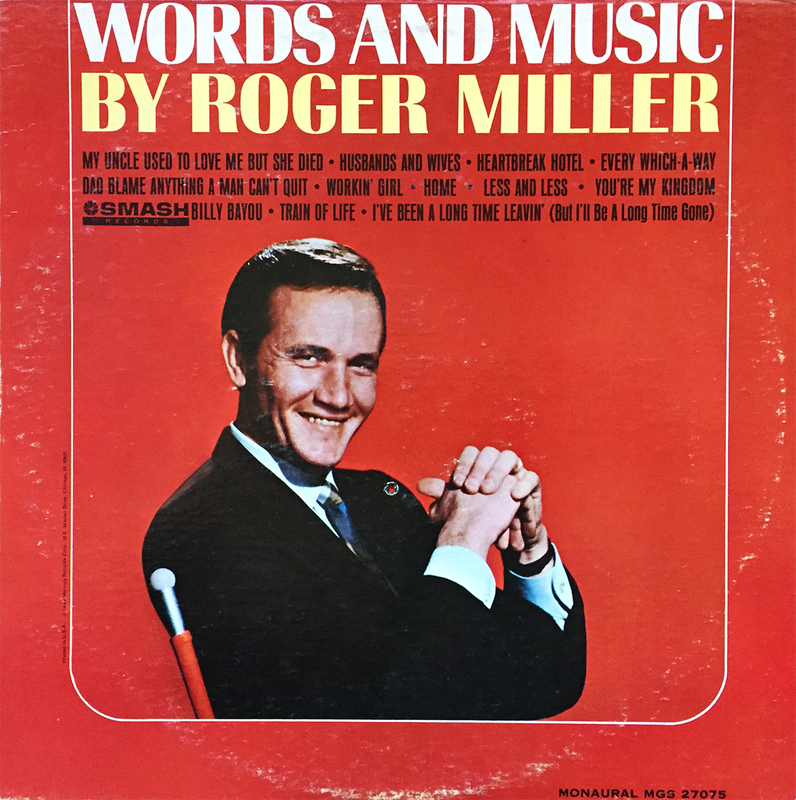 (The UK version also includes Mothers Little Helper… the bastards...). If you don’t already own this essential piece of rock history, put it at the top of your list. Mom and pop Dorsey must have been proud parents. 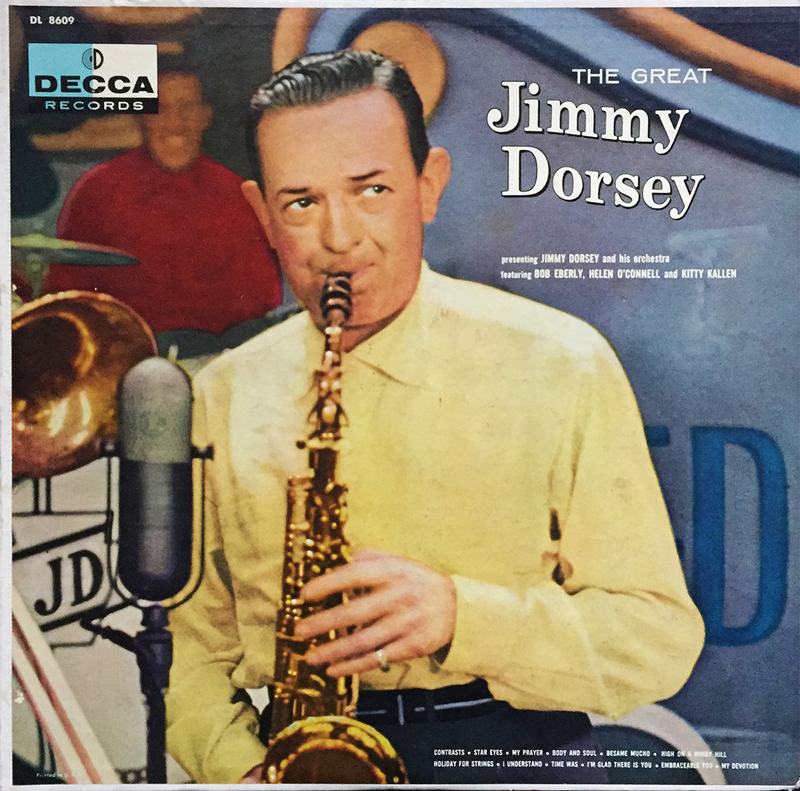 Jimmy, older brother to Tommy, enjoyed an immensely successful career as band-leader and musician (clarinet and saxophone). He teamed up with his brother in the late 20s and early 30s to form The Dorsey Brothers Orchestra. The commercially successful brothers would go separate ways on separate labels, and would each find several years of critical acclaim. The Dorsey Brothers Orchestra would reunite in 1945, and again in 1954 to perform on Jackie Gleason’s Stage Show, a successful weekly hit television show centered on The Dorsey Brothers Orchestra (at this time, a new incarnation from the original). Both brothers would be dead by the end of 1957, but with the power of music, their legacy lives on. 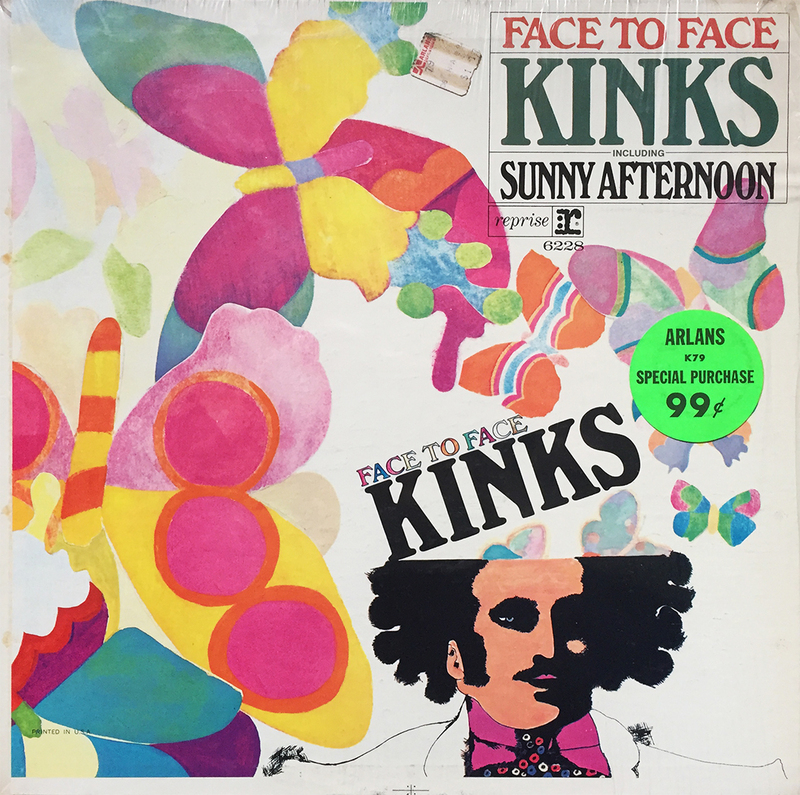 Overcast and breezy days make me want to spin Kinks records. Not sure of the correlation there, but I’m not going to fight it. In reflective times such as these, might I suggest the 1966 classic, Face to Face. Though she may have a few blemishes, I’ll gladly nab The Animals’ Animalization for a cool $0.92. G’wan have to spin this fool first chance we get. 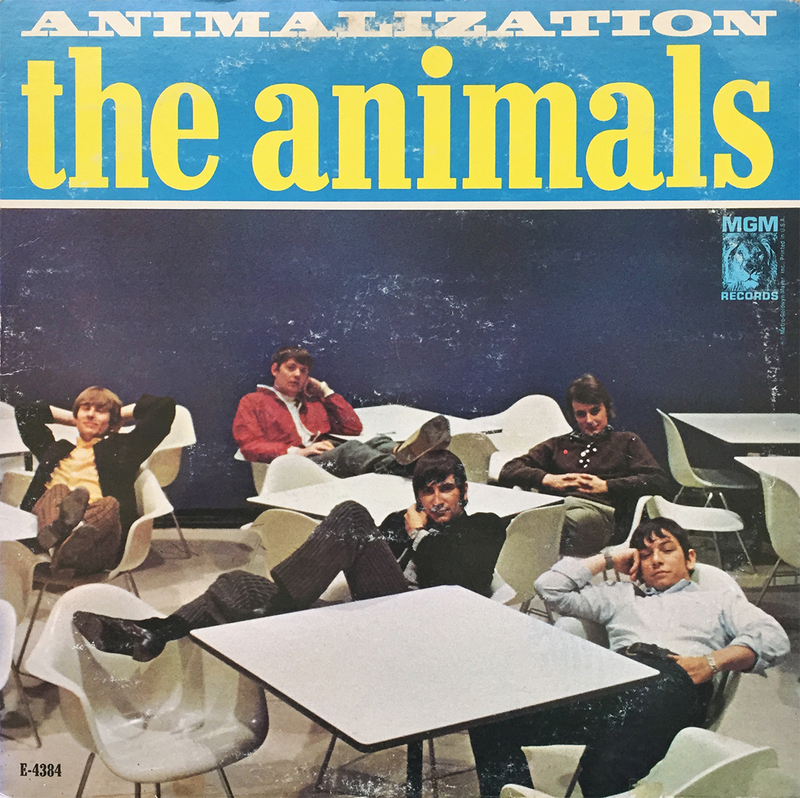 The Animals were my first introduction to the British Invasion, so although I’ve moved on to brighter, Kinkier horizons, I’ll always have a special place in my heart for my first. 1966’s Blues Breakers with Eric Clapton, aka The Beano Album, is John Mayall’s first studio album, and his second overall. 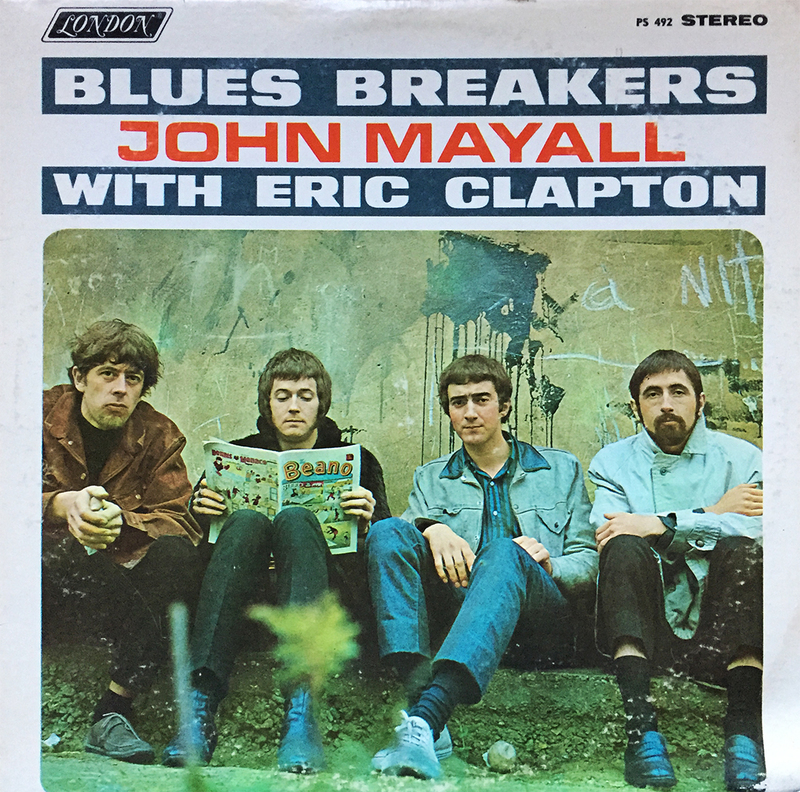 Featuring a comic-reading, and marginally defiant Eric Clapton, Blues Breakers with Eric Clapton is widely considered John Mayall’s most popular, although not best, output, and is ranked by Rolling Stone magazine at number 195 of The 500 Greatest Albums of All Time. Also, I found it at my local brick and mortar for only $1 (hence the title of this post). Oh, Wayne Newton. 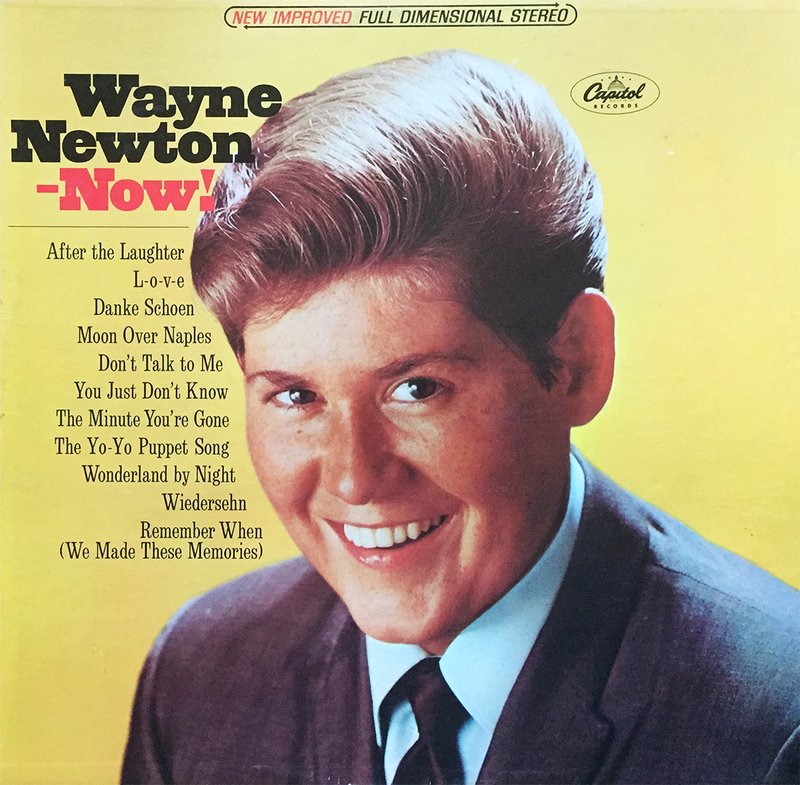 I’ll be the first to admit that I don’t get enough solid Wayne Newton time these days. It’s a shame, really. The voice of a songbird dressed as a Native-American Las Vegas crooner, Carson Wayne Newton is known to many people by many names. Mr. Entertainment and The Midnight Idol to name a few, Mr. Las Vegas is still performing at the young age of 74, and has a series of upcoming shows in Vegas starting on 11/28 and going through the end of the year. If you find yourself pulling slots and huffing secondhand smoke in the middle of an air conditioned desert, spend a few intimate hours with this Sin City legend. 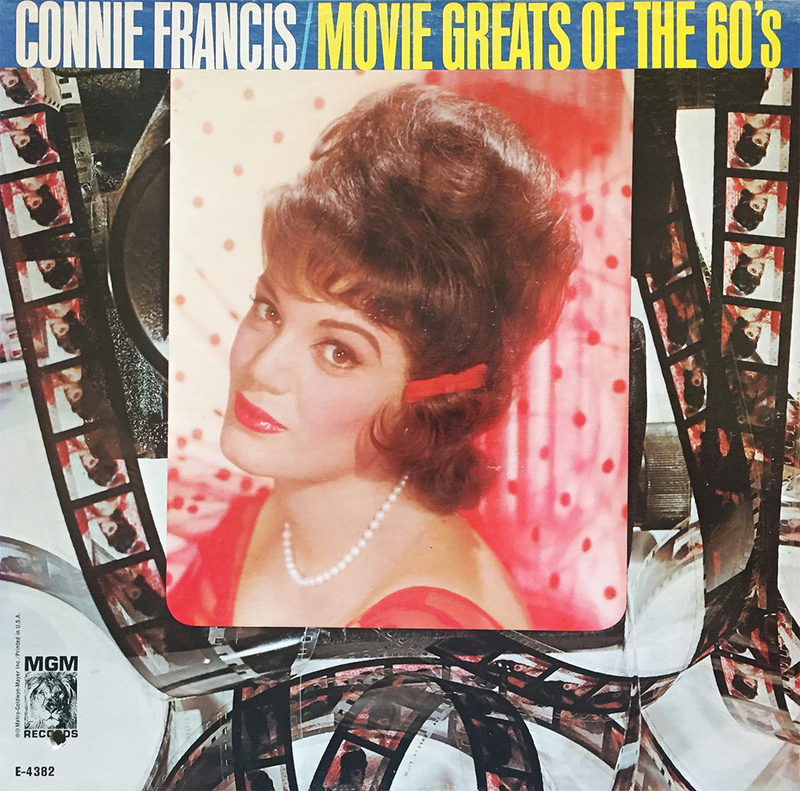 On the search for a decent rendition of Bert Kaempfert’s Strangers in the Night (a question I ask myself multiple times a day), then look no further than Connie Francis’ 1966 release, Movie Greats from the 60’s. I’m partial to the Rogers & Clarke version, myself. Starting any viable discography with a Greatest Hits album is both shameful and amateur… but I did it anyway. 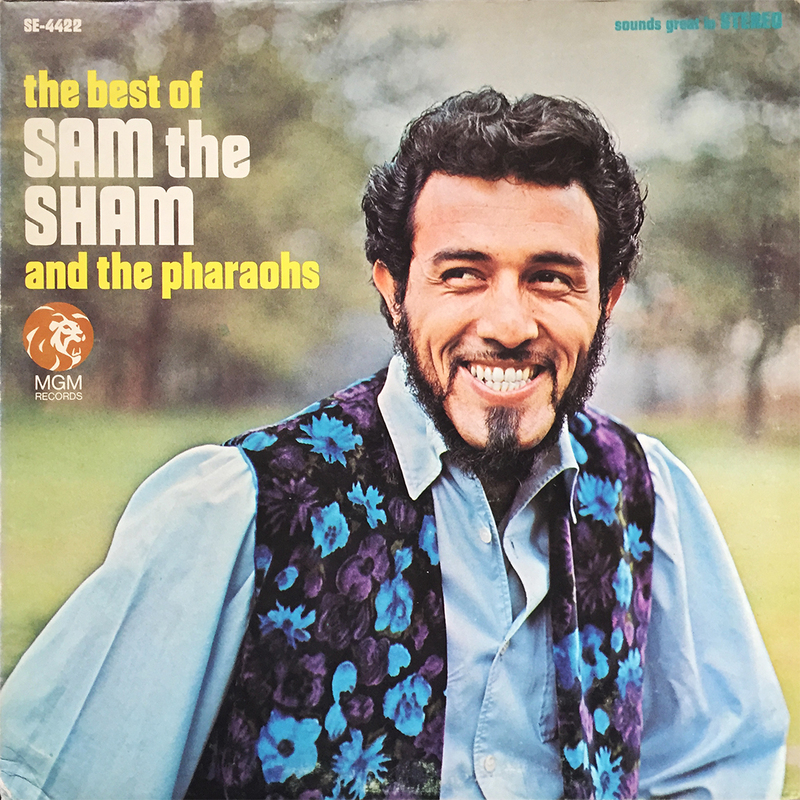 I couldn’t find either of Sam the Sham and the Pharaohs’ first two albums, Wooly Bully and Their Second Album, so I settled for this shameful, yet strikingly enjoyable Best of. As a child of the 80s, it’s painfully difficult to listen to Wooly Bully and not think of the opening scene in 1984’s Splash. I try, desperately, but to no avail. Be that as it may, I’m more than pleased with my disgraceful $7 purchase, I just wish it wasn’t my first by this clever, off-beat outfit. Anyway, happy Friday. The Ballads and the Beat! 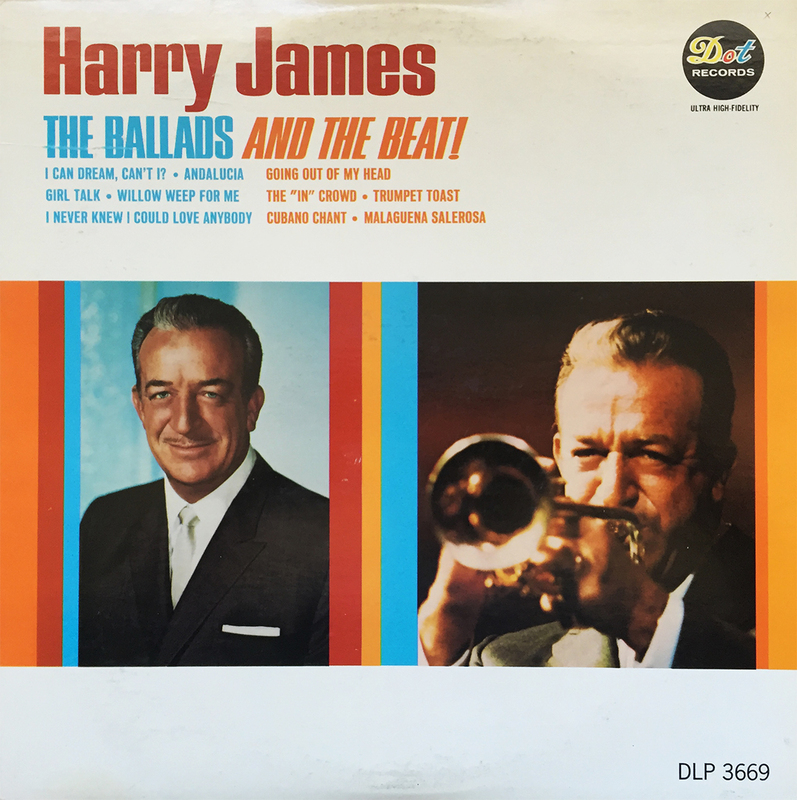 Harry James was a music making machine throughout his illustrious career. Having put out five studio albums between 1965 and 1966 alone, this trumpet-pumping, band-leading barbarian gathered a ton of much deserved respect throughout the swing scene, and his timeless music has pushed him to the front of this historical genre. 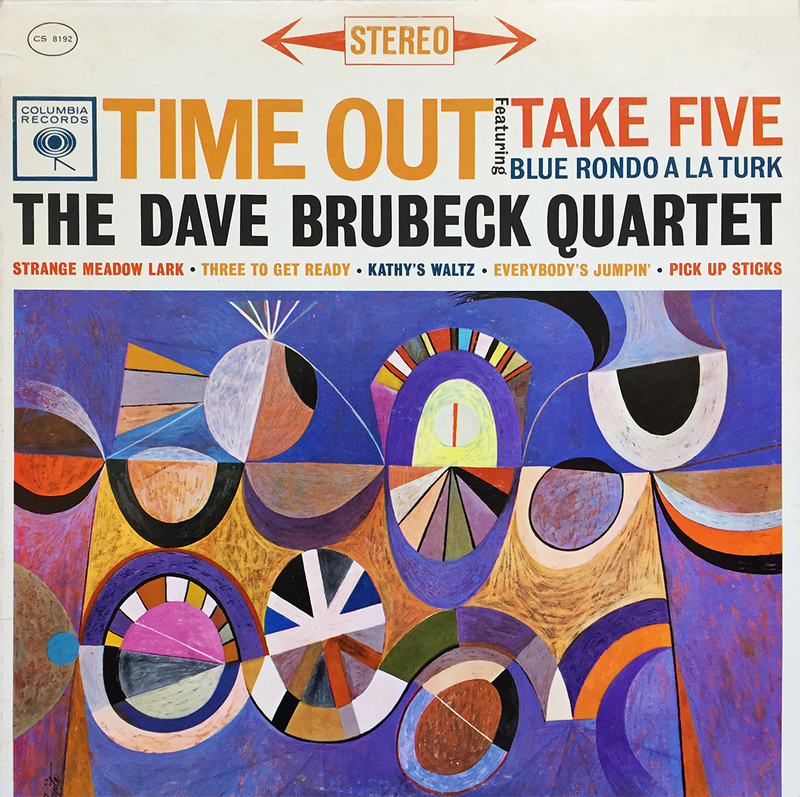 Dot Records was Mr. James’ fourth label, having released several other noteworthy albums for Columbia, Capitol, and MGM, and as you can clearly see, knew how to design an album cover circa: 1966. Enjoy a bit o’ the swing, now n’ again. As a general rule of thumb, it’s often and widely understood that starting with the first album by any new artist as an appropriate and logical decision to make. Not the case with Tim Hardin’s first album, Tim Hardin 1 I’ll have you know. His 1966 debut was officially his first record, but it wasn’t his first, or even the second recorded. 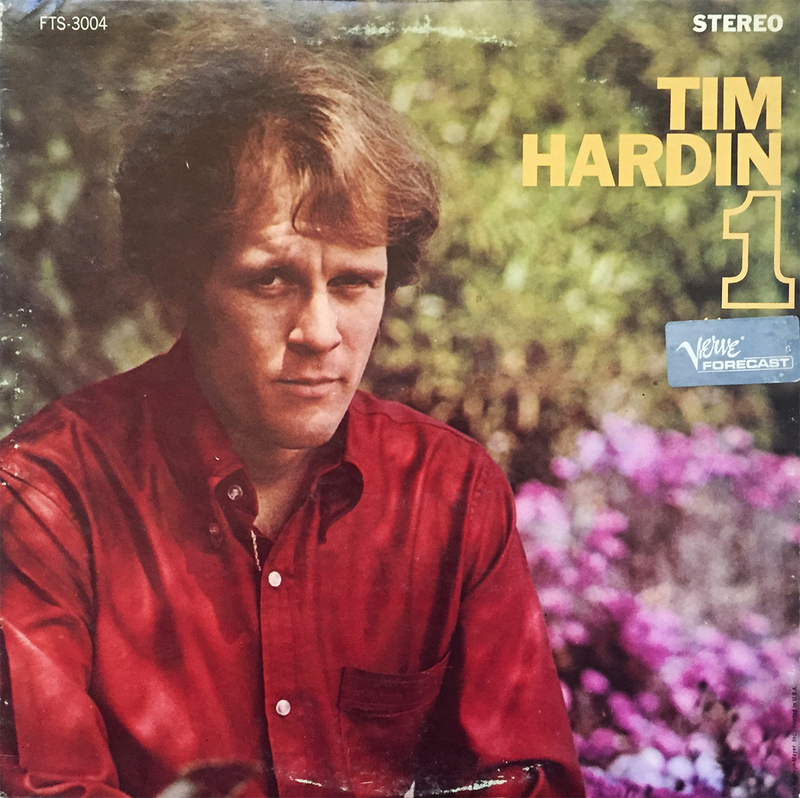 1967’s This is Tim Hardin and 1968’s Tim Hardin 4 were both recorded prior to the release of Tim Hardin 1, and I’ll say again (like a broken record), both are by far his best outputs. Sure, Tim Hardin 1 has Reason to Believe, a song in which he wrote, but that which Rod Stewart made famous, and sure it has Smugglin’ Man (a personal favorite), and of course How Can We Hang On to a Dream (another which he wrote), that was covered by Emerson, Lake & Palmer and Fleetwood Mac, but newbies to the Tim Hardin carnival should start at the beginning, with This is Tim Hardin. Thank yourself now, and thank yourself later. You’ve had a rough week… treat yourself.